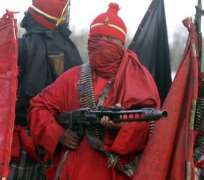 Nigerian rebels Sunday claimed three attacks in one day against Royal Dutch Shell's facilities as part of a campaign to cripple Nigeria's multi-billion-dollar oil industry. The Movement for the Emancipation of the Niger Delta (Mend) said in a statement it had "pounded" a Shell pipeline at Adamakiri at 2.30am (0130 GMT) and another at Kula shortly after. Shell's spokesman Precious Okolobo only confirmed two attacks to AFP and added that production did not appear to have been greatly affected. "There have been two attacks on installations in our eastern operation. Impact to facilities, environment and production is being investigated," he said, adding that he was waiting for the results of an on-site inspection. Hours after the first two attacks, Mend also admitted responsibility for an attack on Shell's Ofirma oil field that became "engulfed in fire". But a Shell official denied that there had been a third strike, saying the alleged incident was part of the attack on two Shell oil pipelines in southern Rivers state early Sunday. Shell has become a regular target for militant attacks in the restive Niger Delta over the past three years, forcing it to shut some facilities and several times defer contracted deliveries to clients. The Anglo-Dutch oil group said Wednesday it was forced to defer shipments of crude from its Nigerian Forcados exports terminal for two months due to delays in repairing a key pipeline blown up in March. Back in February, it declared force majeure on shipments from its main Nigerian Bonny terminal due to increased attacks by rebels on key facilities. Mend, which this month declared an "all-out" war against the oil majors aimed at halting production, had claimed an attack on another Shell oil pipeline in Bayelsa state on Thursday. Local media said some 185 000 barrels per day of crude had been shut down as a result of that attack. Mend also issued a warning on Sunday against Chevron, accusing the US oil giant of letting the Nigerian military use one of its air strips for jet fighters and helicopter gunships. "By allowing its facilities to be used in committing atrocities against the host communities where it drills oil and gas from, Chevron has repeated the same mistake by Shell against the Ogoni communities and will pay a price in double measure," the statement said. On Saturday Mend attacked a major pipeline supplying crude oil to Italian oil group Agip's Brass terminal. Agip confirmed the act of "sabotage." Mend has staged numerous attacks on international oil facilities in southern Nigeria as part of a campaign since December 2005 to get what it calls a fairer distribution of the region's oil wealth for the local Ogoni people. Unrest in the Niger Delta has substantially reduced Nigeria's oil output, putting pressure on crucial export earnings. Nigeria's daily oil output currently stands at 1.8 million barrels, according to the June report of the International Energy Agency, considerably lower than the 2.6 million barrels a day in 2006. Nigeria was Africa's leading oil producer but it has been overtaken by Angola since the troubles in the Niger Delta started. Nigerian President Umaru Yar'Adua has promised to unveil details of an amnesty package for militants within a week, as part of efforts to end the unrest and save the crucial oil and gas industry.